Editor’s note: Thank you to So Delicious for sponsoring this post! We have quite the variety of food allergies and preferences in my family. My mother in law is gluten and dairy intolerant, my sister is vegan, my parents and I are vegetarian, and others avoid certain food for health reasons… the list goes on. Of course, with so many various allergies to watch out for, planning a dinner menu can be tough. The hardest part of a menu for me? Dessert. How do you plan a dessert that is both dairy and gluten free, tastes absolutely delicious, but is light on the stomach? Something that satisfies a sweet tooth, but doesn’t put everyone in a food coma? Baked goods like pies and cakes are difficult because of the gluten, and even ice cream can be tough because of dairy allergies. The search for the perfect dessert was solved when I found So Delicious ® Oatmilk Frozen Dessert at Sprouts Farmers Market. 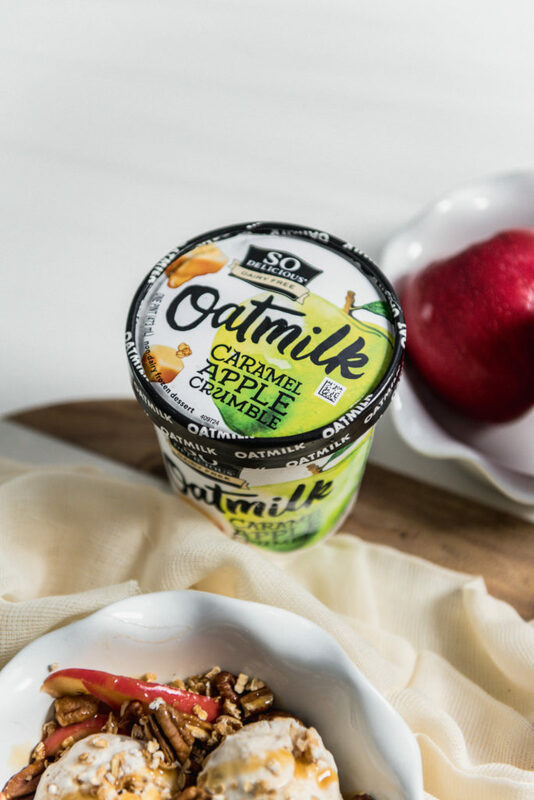 The Oatmilk “ice cream” comes in flavors such as Caramel Apple Crumble, Oatmeal Cookie, and Peanut Butter Raspberry which are all gluten free, dairy free, soy free, and 100% delicious. Now is the perfect time to try out these new desserts: Sprouts is having a “Checkout Challenge” in their mobile app – offering buy 3 get 1 free deals on So Delicious Frozen Desserts through June 4. It’s a great way to try all the flavors. So Delicious has a special place in my pantry (and freezer) because the company’s parent, Danone North America, has done so much to become a Certified B Corporation, and all So Delicious® products are dairy free, non-GMO, Vegan, and kosher. Most products are gluten free as well! It makes it so easy to pick options that are plant based and accommodate allergies. I love this dessert because it looks fancy, but is super easy to prep in advance – perfect for a busy night with guests. I used the So Delicious Dairy Free Caramel Apple Crumble flavor because I wanted to go for an apple pie flavor for this dessert. To prep this dessert in advance, I cook the apple topping and store in the fridge. I also prep the oat and pecan topping beforehand. 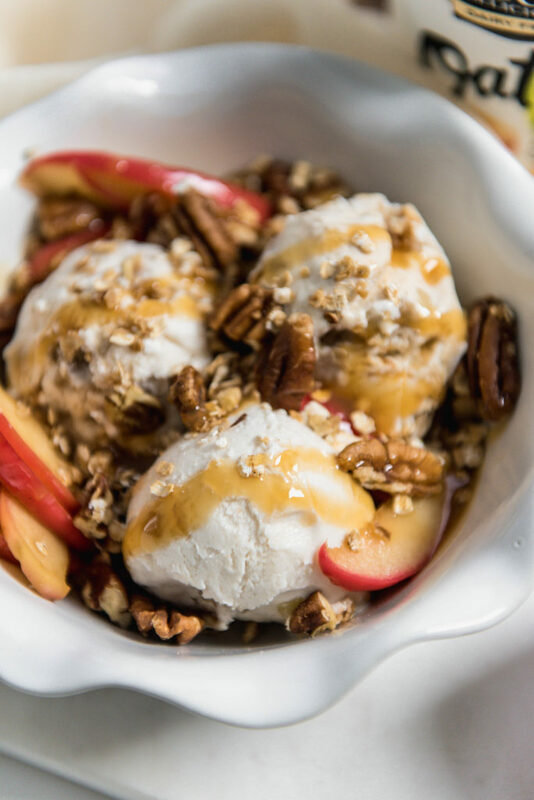 Then, right before serving, just warm up both the apples and oats and serve warm with the cold OatMilk “ice cream”! 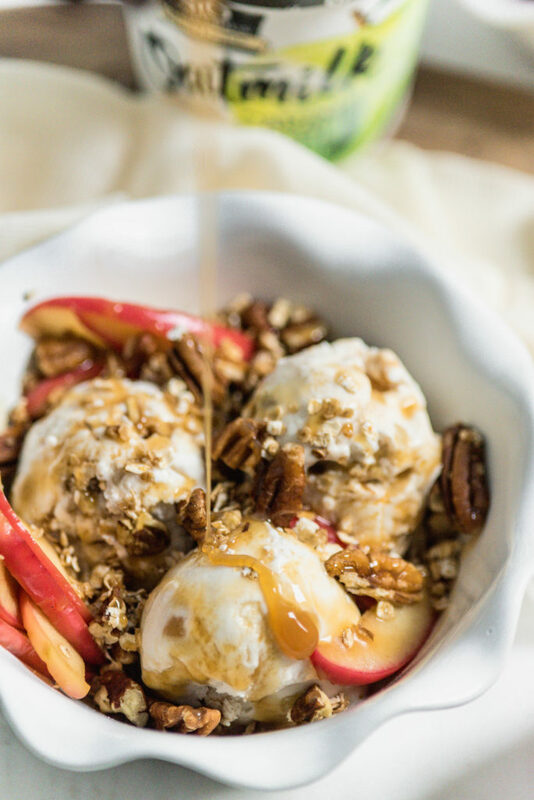 You can also set up a Sundae Bar with various flavors of So Delicious “ice cream” and toppings toppings like the apples, caramel sauce, and crunchy topping in this recipe. Then guests can make their own signature sundae – it’s perfect for kids – and parents. Add 1 tbsp. of coconut oil, brown sugar, lemon juice, and apples. 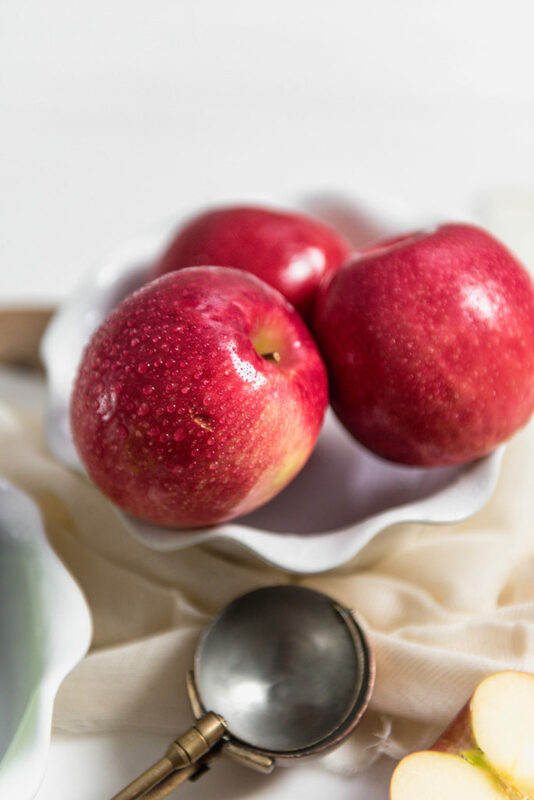 Cook for 5 minutes or until apples are softened. Remove apples and thicken the brown sugar caramel sauce left in the pan until it coats the back of a spoon. In a small sauce pan, melt 1 tbsp. coconut oil. Add gluten-free oats and vanilla and chopped pecans. Cook for 2-3 minutes until toasted, stirring constantly. 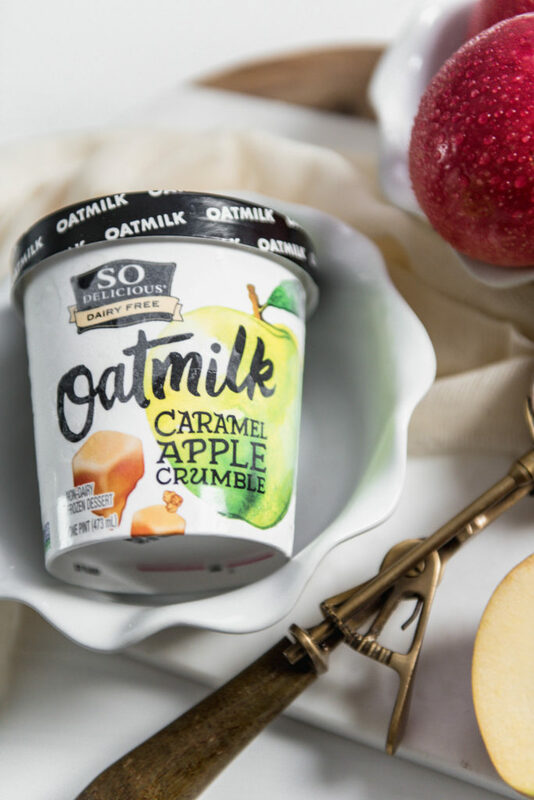 Scoop a generous serving (one serving is 2/3 cup) of the So Delicious Caramel Apple Crumble Oatmilk Frozen Dessert into each bowl. Top with warm apples, warm crunchy topping, and caramel sauce. 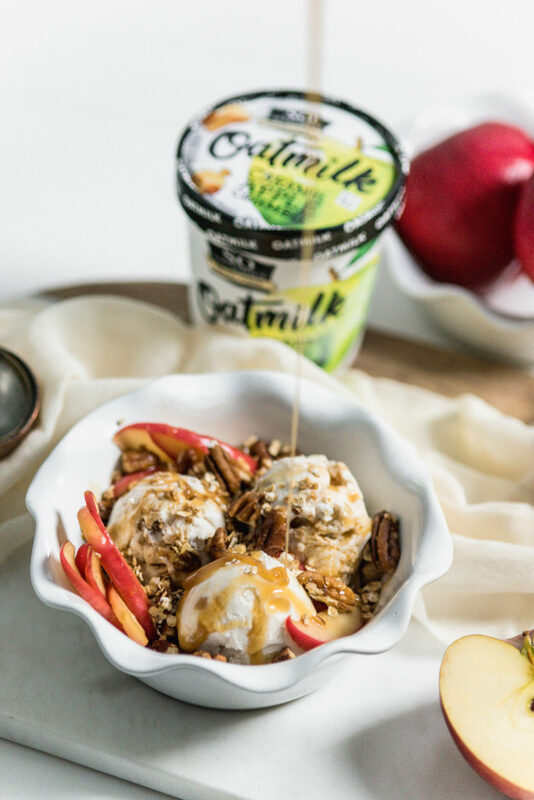 The apples, caramel sauce, and oat topping can be made in advance – just heat up before serving. Have you made desserts that are dairy-free, gluten-free, soy-free, and vegan before? What are your go to recipes? Let me know in the comments!